Even from the earliest days, hangers have been looking for ways to lighten and simplify hammock suspension, particularly for camping and backpacking. Some of the first suspension systems were rope-based, which were thick, bulky, and heavy. I distinctly remember getting a Grand Trunk Nano hammock—the lightest hammock on the market at the time—and noticing that my suspension system weighed more and took up more space in my pack than the hammock. I’m not advocating going lightweight as a pursuit on its own, but rather to find a balance between safety, adjustability, low bulk, and ease-of-use. At its core, a suspension system spans the gap between the hammock and the anchor point. It should also provide a mechanism to adjust that gap, depending on how far apart the anchors are. Some systems combine the anchoring (e.g., webbing strap) and suspension into a single system. Out in the field, you don’t always know what types of trees you’ll have to work with, particularly how far apart they might be and how big around. If your suspension system isn’t versatile enough, you could be stranded. Over the past several years, it has been interesting to track the shifts in hammock suspension. Folks have tried everything from going shorter, thinner, and even experimenting with different knots, hardware, and related techniques. Some trends have revolutionized hammock suspension completely, such as the introduction of lightweight-but-strong Dyneema cordage like Amsteel and Dynaglide. Today, I feel we are in a pretty good place where we’re finding a balance between lightweight, low bulk (easier to pack and carry), and easy to use systems. You’ll find “camps” of hangers who advocate their favorite system such as cinch buckles and straps; Marlinspike hitch and Whoopie Slings; or carabiners and daisy-chain straps. The “best” system is what works best for you. In this post, my goal isn’t to persuade you to pick or switch from one system to another. Rather, I want to highlight some of the lightest systems out there as a comparison. I should also note that these lightweight systems are better suited for experienced hangers. I highly recommend new hangers start with no-nonsense daisy-chain suspension. I personally use several different systems, sometimes based on the hammock I’m using, the expected trail conditions, or sometimes just to try something new. I do think it is a good idea to know a few different techniques, particularly how to use some knots or lashings when other systems fail or don’t work. These options are listed in no particular order. The DreamHammock and Arrowhead Equipment are very similar, but I wanted to show the effect of a different length of strap to a system. The Hammeck shows an example of eliminating the Whoopie Sling completely (Hammeck no longer sells gear :(). These three options are virtually interchangeable as each vendor (and many others like them) can each be customized to be nearly identical to the other. Notes Remove 6-8 ft of the Muletape on each side and reduce the total weight to 100 g (3.5 oz). This system provides the most length per ounce of any system. Paul also sells Dyneema Whoopie Slings that weigh 0.6 oz (17 g), which would save 0.3 oz (8.6 g) over a 7/64 Amsteel. The Hummingbird Hammocks come with a unique “soft shackle” system to clip into the sling. What is the difference between 1″ wide mule tape and 1″ webbing strap. Different material and construction, but basically the same. Mike tape is used in the electronics and power industries to pull cable and the strap is slightly lubricated. I’ve converted all my hammocks to muletape suspension. So easy to setup. I don’t use a webbing lead that goes around the tree since muletape is already “webbing like” enough. Bull line is the same as mike tape only wider. Hey Derek, this is a little unrelated, but is there any chance you could do a review on the Therm-a-rest slacker hammock bug net. I’m really interested in this bug net for my Boundary waters trip this summer. Thanks if you do this I would really appreciate it :). Also keep up the great reviews! I always come to your site when I have questions and they are almost always answered. Thanks Bryce. I’ll reach out to them and see what I can do. Thanks a lot Derek, I really appreciate it, keep it up! Bryce, Therm-a-Rest recently sent me their bug net to review. I should have a full review within the month! I’ve tried a number of these with great success such as marlin spikes with old sticks as toggles. I’ve finally took Derek’s advice and removed my whoopie slings off my two warbonnet hammocks (traveler and blackbird) and paired them with their stock tree huggers for a very light and compact suspension method. I’ve found that many tree huggers won’t work with the massive old growth trees here in the PNW. I added short continuous loops to the hammock ends and recycled the whoopie slings as suspension. Now I have something long enough for the largest trees and half as light as a Eno slap or kammok Python straps. Thanks Derek. I think I was only rating the listed load on the straps. I use several different suspensions on my hammocks. The latest on my GT Ultralight started as an adaptation of Sgt. Rock’s “You’re Gonna Die” Dynaglide setup. 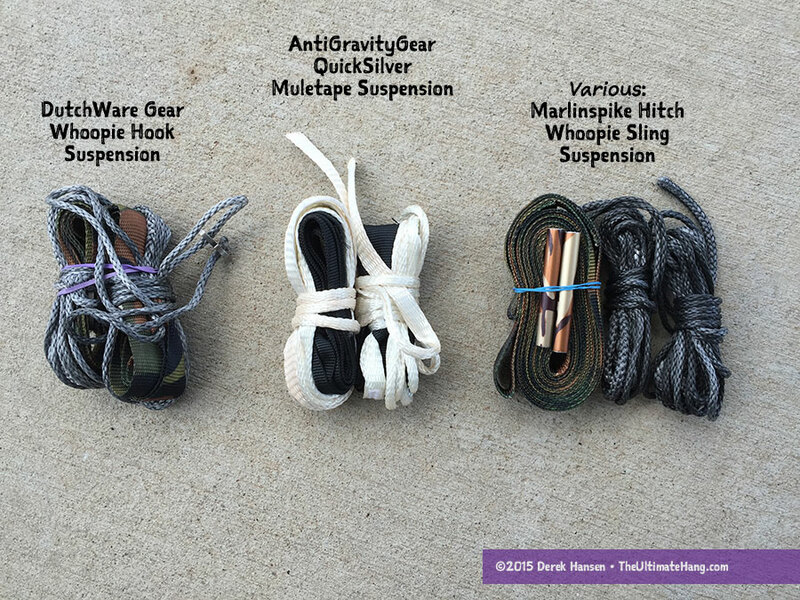 I started out using Dynaglide whoopies and continuous loops on AntiGravityGear 14′ Muletape straps, but soon realized a marlin spike in the strap worked great. Set the spike and hang the continuous loop over the knot. It seems to hold well and I haven’t noticed any problems after hanging for a week. It is a very simple and adjustable system. Thanks for the post Derek! I like the Warbonnet buckle and strap system. I was going to convert my Hennessey but I see they are not available right now??? You can pick up a cinch buckle system from Dutchwaregear.com. They have mid kits for Hennessy. Changed the ENOs to the cinch buckle system and converted the Hennessy with short Amsteel dogbones at either end to still use the tarp in the intended way. Everything worked great, thanks for your help suggesting the dogbones. The reason I have been using a 1″ webbing is so I don’t harm the tree. However, I see you are using a much thinner muletape – does this not harm a tree? If not, I’m all over it. Any input would be greatly appreciated. I have to qualify that there is no one standard that will work for every tree. I have to be careful here because I don’t want to be hypocritical, while at the same time acknowledging there is some variability in reality. I stand firm that thin ropes that you often see used in some hanging kits, are a bad idea as they more easily tear into the bark. I acknowledge that there are ways to minimize that damage by using different wrapping techniques, but for the lay user, it helps to simplify and standardize the rhetoric into the 1-inch strap. Like the ubiquitous 30-degree hang angle, the 1-inch strap is a good starting point. Some trees have very soft or brittle outer bark that nearly any strap width will leave an imprint on. Other trees, like the Ponderosa Pine in my region, are hearty and have tough, thick, resilient bark. That said, I encourage folks to have multiple straps of varying thicknesses to accommodate different types of trees, depending on the trip plan. As you plan your trips, determine what works best in that area or for a particular trip. Mule Tape is 3/4 inch thick, which is suitable for many types of trees, particularly those with robust bark. It is the narrowest strap I recommend, particularly for hearty trees. Ideally, I would prefer folks go for the thicker Bull Line, which is similar to the Mule Tape in construction, only wider. If you choose Mule Tape, I would test it first on the type of tree you expect to hang on and see how it holds up. Maybe upgrade to the Bull Line, or a standard 1-inch thick strap. The widest strap I have is 2 inches, but I rarely use it. Thanks for the clarification. That is what I figured, but wanted to make sure. I’ll just play conservatively and stick with a 1″ strap. Hi Derek: I enjoy your articles and also have your Hammock book. I would like to share my light weight suspension with you. 8in. loops on hammock,10ft Dutchware kevlar tree straps, 4ft. amsteel dogbonz to extend tree straps if needed and Bias Hammocks strap anchors. See Hammockfan’s video for strap anchor instructions. This system weighs 3.8oz and is easy to adjust. The kevlar straps are quite soft so be sure you have the strap anchors installed correctly before you get in the hammock. Daisy chained mule tape( for a meter) next meter unknotted crept for end and a pair of 6 ft Kevlar tree straps and 2 carbon toggles. I’ve 6 meters of mule tape left ,and it would be even lighter to just becket hitch to tree strap and to continuous loop , but after my first hammock trip( 2 weeks) the adjustability was frustrating..
You were having trouble with the Mule Tape, the Becket Hitch, or the adjustability of that combination? I find that the Becket Hitch provides infinite adjustability, much like a cinch buckle system, since you can tie off at nearly any point along the suspension line. I’d love to hear more of your experience. About 2.2 kg with bedding n mat..that’s with a dutchware hammock and a tier gear( Tasmanian ) silnylon canteray tarp..
I’ll have to check them out. Are they just spring gate carabiners? Yes, but they use a round bulb on the end of the gate that matches up with a female machined socket at the closing joint (sorry, I just don’t know how to do justice to a worded explanation). I can say we (me and a few fellow workers) preformed a “”shade tree”” failure test just for fun with a fork truck and a #3800 railroad wheel (it only failed when we “bounced” the wheel while it was suspended). The design is a good one in my humble opinion. Was experimenting with the marlin spike rig today, come to find out the spike is actually completely unnecessary, more of a false sense of security. Since it relies on the knot itself rather than the spike it’s just as effective pulling the knot tight (pull more webbing through than ordinary to ensure it doesn’t untie while pulling it tight) & placing the whoopie over the top of the knot like ordinary. Tried it so far with whoopie & hammock bliss straps as well as the stock rope that come with the hammock bliss/grand trunk hammocks. Who would have thought that the toggle was just another fear backpackers pack that this UL is quite happy to toss out. Depending on the weight of the spikes used & the straps used it could potentially be one of the lightest setups. I had considered that but doesn’t work overly well with the way the whoopie sling works, messes up the adjustability. Though does work with the rope very well. I have made myself some whoopie slings of 7/64 Amsteel and am happy with their light weight and ease of adjustability, but less happy with their limited range of length adjustability. Is there any reason you could not put a locked Brummel loop on one end of a length of Amsteel and then use a Becket hitch to tie the other end to the continuous loop on the hammock? That would seem to combine light weight, easy adjustability, and a wide length-range in one solution. Hey Derek! Have you used ENO’s whoopie sling, “Helios”? I’ve seen and read about it, but I’d love to hear your opinion / see it reviewed / see it added to the table above. Yes! I’ve handled it and tested it. I would say it works just fine. I’d like to see more durability testing.